While everyone has been watching the Strait of Hormuz amid rising tension between the U.S. and Iran, a chokepoint on the other side of the Arabian Peninsula is now at the center of the action. Saudi Arabia temporarily halted all oil shipments through the Bab al-Mandeb strait after Saudi Aramco reported attacks from Houthi rebels on two oil tankers. The two ships in question were very large crude carriers (VLCCs), each carrying 1 million barrels of oil, and one of them sustained minor damage. The Houthis said that they have the naval capability to hit Saudi ports and other targets in the Red Sea, according to Reuters. In response, Saudi energy minister suspended oil shipments through the strait. “Saudi Arabia is temporarily halting all oil shipments through Bab al-Mandeb strait immediately until the situation becomes clearer and the maritime transit through Bab al-Mandeb is safe,” Khalid al-Falih said. The Kuwait Oil Tanker Company said that it might also suspend tanker traffic through the narrow chokepoint. The sudden risk to two of the world’s most critical chokepoints has pushed up oil prices a bit this week, although serious outages have yet to materialize. Nearly two-thirds of the world’s oil trade travels via maritime routes. Here is a quick rundown of the top global chokepoints for the oil trade. 2. Strait of Malacca. The second most important chokepoint in terms of oil volumes is the Strait of Malacca, between Indonesia and Malaysia, which saw 16 mb/d of oil in 2016. The Strait links the Indian and Pacific Oceans, and is the main route for oil from the Middle East to reach Asian markets. The Strait is only 1.7 miles wide at its narrowest point, “creating a natural bottleneck with the potential for collisions, grounding, or oil spills,” according to the EIA. China, the largest oil importer in the world, has a strategic interest in seeing uninterrupted tanker traffic through the Strait. 3. Suez Canal and SUMED pipeline. Located in Egypt, the Suez Canal is another crucial chokepoint. Combined with the SUMED pipeline, which bypasses the canal and connects the Mediterranean to the Red Sea, the two routes account for roughly 9 percent of the world’s daily seaborne oil, or 5.5 mb/d. Most of the oil goes north, from the Middle East to Europe. The Suez Canal cannot handle the largest oil ships, ultra-large crude carriers (ULCCs), and it can only handle VLCCs that are not fully laden. As such, VLCCs can offload some of their cargo onto the SUMED pipeline, and then the lighter ship can pass through the canal, picking up the oil at the other end of the pipeline in the Mediterranean. 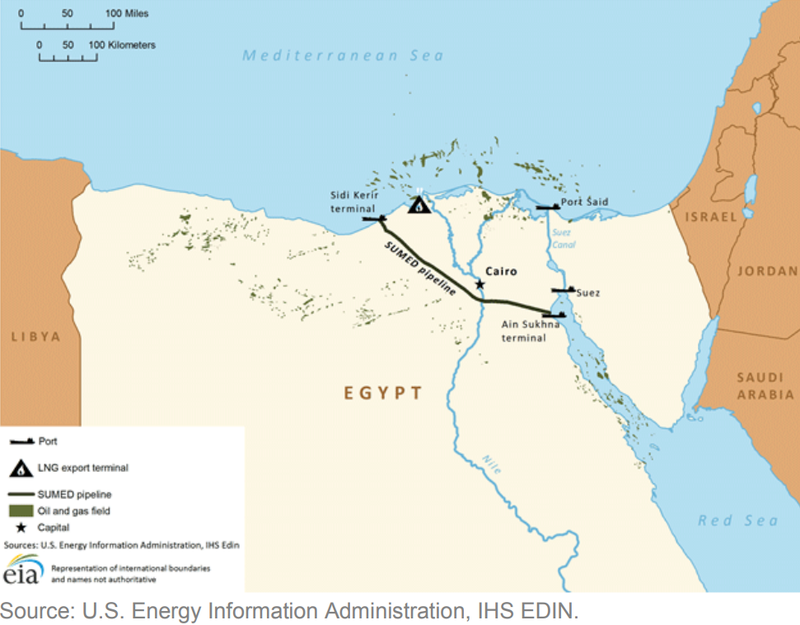 The SUMED pipeline can carry 2.34 mb/d, and offers a hedge of sorts against an outage at the Suez Canal. There are a series of other smaller chokepoints, but these four are the most important in terms of size of the trade and because of the risk. 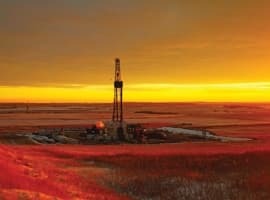 An outage at any of these locations, even for a brief period of time, has the potential to force steep oil price increases, with the effects magnified by the size and duration of the outage. Even the whiff of a potential outage, particularly when the oil market is tight, can add a few dollars per barrel as a risk premium. This is a scary article! So, we keep our Sons and Daughters in the US Military, armed to the teeth, ready to risk their lives to keep the oil choke points open, to keep the worlds economy running. Really Sad, when you think about it. We need to do all we can to diversify our fuel supplies. While Bio-fuels can’t replace hydrocarbons, they certainly can help diversify our fuel supplies and need to be promoted. I am calling of Senators Ted Cruz and John Barrasso, to end their War on Ethanol and other bio-fuels. Let’s stop the foot dragging on allowing year-round sales of E-15 and other mid-level ethanol fuel blends. We need them. My Son and his family were in Dallas last summer, having evacuated Houston during Hurricane Harvey, when the Dallas Area ran out of gasoline. It wasn’t funny. Senators, lets stop playing games with our Fuel Security, our Future and our Children’s Lives! American Bio-fuels don't go through any of these volatile - Oil Choke Points! Maybe its time to start valuing them more. 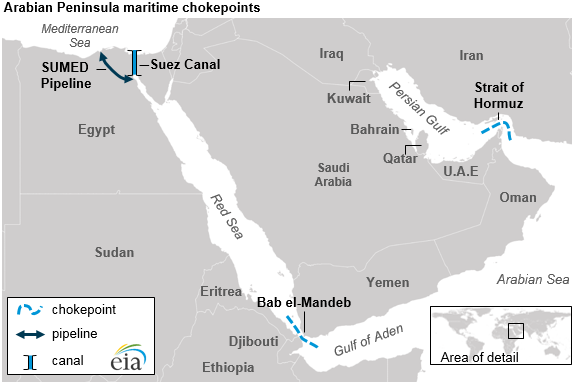 Saudi Arabia’s halting its oil shipments through the Bab al-Mandeb Strait after attacks by Houthi rebels on two of its oil tanker demonstrates the fragility of these four key chokepoints and how easy to deter oil tankers from passing through them. 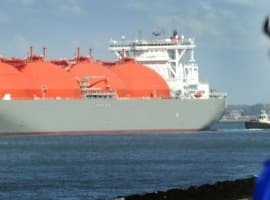 And despite the bellicose language of President Trump and Iran’s threat to close the Strait of Hormuz if its oil exports were prevented by US sanctions, I don’t think there will be a need for Iran to take such a drastic measure since US sanctions are doomed to fail and Iran is not going to lose a single barrel of its oil exports. Moreover, such drastic action might lead to a war with the United States. Still, Iran’s threat to close the Strait of Hormuz should be taken seriously. The Strait at its narrowest point is 21 mile wide so it is impossible militarily to close it completely. What Iran can do is mining it stealthily with the expectation of a mine hitting an oil tanker and sinking it. Such an accident would in itself deter tankers from crossing the Strait thus causing a disruption in oil supplies until the mines are cleared. Alternatively, Iran could threaten sinking tankers crossing the Strait even if escorted by the US Fifth Navy in the Gulf. This threat might deter tanker owners around the world from sending their tankers across the Strait under pressure from global insurance companies until tension has subsided. In this way, Iran would have achieved its goal of disrupting oil supplies peacefully. dependence on oil imports has created an increasing sense of ‘energy insecurity’ among Chinese leaders. Some Chinese analysts even refer to the possibility that the US is practicing an ‘energy containment’ policy toward China, or could implement one in the future. Chinese leaders tend to believe that dependence on imported oil leads to great ‘strategic vulnerability’. With the American Navy patrolling the southern end of the Strait of Malacca and the Indian Navy patrolling the northern end, China feels sandwiched in and strategically vulnerable. The former president of China, Hu Jintao, has referred a number of times to what he describes as the ‘Malacca dilemma’. China’s answer to the “Malacca Dilemma” was the newly-opened China-Myanmar crude oil pipeline. The 479-mile-long oil pipeline, with an initial transport capacity of 442,000 b/d, runs from the port of Kyaukpyu on Myanmar’s west coast and enters China at Ruili in Yunnan Province. Iraqi oil for instance could be shipped through the Iraqi-Turkish pipeline (ITP) to Ceyhan on Turkey’s Mediterranean coast and from there through the Suez Canal to the Indian Ocean instead of through the risk-prone Strait of Hormuz and the Strait of Malacca before reaching Myanmar and entering China. China financed the pipeline as part of its energy security. All the Gulf Cooperation Council members (Saudi Arabia, UAE, Kuwait, Qatar, Oman and Bahrain) with the exception of the UAE and Oman will be affected seriously by any closure of the Strait of Hormuz. 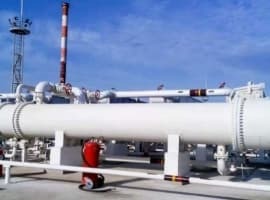 The UAE has already built an oil pipeline with 1.5 mbd-capacity from Abu Dhabi to Fujairah on the Gulf of Oman that bypasses the Strait of Hormuz altogether. Saudi Arabia could still export up to 4 mbd through an oil pipeline traversing the country from east to west at the port of Yanbu on the Red Sea originally built with Iraqi money to transport Iraqi crude during the Iran-Iraq war. As for Iraq, it is now totally dependent on the Strait of Hormuz for its oil exports since the Iraqi-Turkish pipeline known as the ITP transporting Iraqi oil from Kirkuk to Ceyhan on the Turkish coast on the Mediterranean is currently out of action. Saudi Arabia could still ship 4 mbd from its oil terminal at Yanbu through the Suez Canal to the Mediterranean. However, were the Suez Canal to be blocked either by mines or the sinking of a ship as happened during the 1956 Suez War, Saudi oil shipments could be offloaded onto the SUMED pipeline and is transported from there to Egypt’s coast on the Mediterranean Sea. And since 75% of Arab Gulf oil exports and those of Iran go to the Asia-Pacific region, they can avoid the Bab al-Mandeb Strait altogether. Still, a closure of any of the four chokepoints for a lengthy period of time could send oil prices far above $100 a barrel.